On October, the 26th and 27th, it has been made the International Seminar of Public Policy on Alcohol, organized by the Ministry of Health and SENDA in Chile. 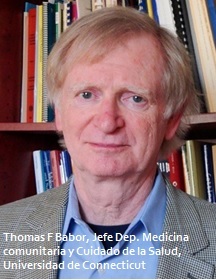 In this event professor Thomas F Babor at University of Connecticut was the principal speaker. Fundación Politopedia talked with him about the importance of public policies and evidence to reduce alcohol consumption. Health programs, health care professionals and public health agencies in government all have a responsibility to support policies that are known to be effective in reducing alcohol-related harm. The alcohol industry has an ethical responsibility to minimize the harm caused by its products at all stages of the production chain, including product design and marketing. The ethical responsibility of the industry for the harm caused by its products cannot be regarded solely as a national issue. As the Chairman of the Community Medicine and Health Care department of the University of Connecticut, which are the effects of excessively consumption of alcohol in children and adolescents and what are the implications in economy for sustained consumption of alcohol of the population? Heavy drinking during adolescence has been associated with lower cognitive ability and abnormal brain development. Alcohol also appears to negatively affect the ability of young people to control their emotions and behaviors, which could lead to long-term academic, occupational and social functioning problems. Early onset of very heavy drinking is thought to increase the likelihood of developing alcohol disorders later in life, potentially due to lasting effects on brain function. In public policies aimed to reduced alcohol consumption, what role do taxes rates play and what are the main consequences of this strategy? People increase their drinking when alcohol prices are lowered, and decrease their consumption when prices rise. Adolescents and problem drinkers are no exception to this rule. Increased alcohol taxes and other measures that raise prices have been found to reduce alcohol-related problems, including crime, traffic accidents and mortality rates. Alcohol taxes are thus an attractive instrument of alcohol policy because they can be used both to generate direct tax revenue for the state and to reduce alcohol-related harm. Governments use a variety of measures: excise and sales taxes on beer, wine and spirits; regulations that set minimum prices, bans on happy hours that use price promotions; and “smart prices, that is, taxation to shift consumption towards weaker types of alcohol. In many countries, the relative price of alcohol has declined with taxes not keeping up with inflation. So, another measure would be to link alcohol taxes with the inflation rate. Which are the effects of Minimum Unit Price (MUP)? In countries that have carried this measure, have them succeeded or failed? Minimum pricing policies prevent below-cost selling of alcohol, loss-leader products, and alcohol price reductions, all of which are attractive to youth due to their increased affordability. For example, alcohol is often heavily discounted in supermarkets to encourage people to come into a store. Some governments have legislated a minimum price below which alcohol cannot be sold. The evidence for minimum price policy is derived from studies in England and Canada. Raising the minimum price of the cheapest beverages is effective in influencing heavy drinkers and reducing rates of harm. The greatest impact is felt among the highest risk drinkers. The greatest health gains are realized among harmful drinkers in the lowest socioeconomic groups. In Saskatchewan, a 10% increase in the minimum price of alcohol reduced consumption of all beverages by 8.4% within two years. In British Columbia, two to three years after implementation, the same price increase was associated with a 32% reduction in alcohol-related deaths, a 9% reduction in acute alcohol-related hospital admissions, a 9% reduction in chronic alcohol-related hospital admissions, a 19% reduction in road traffic violations, and a 9% reduction in crime. Based on your experience of research in alcohol consumption, which is the role of politics to undertake policies that seek the reduce of alcohol consumption? It is important for government officials, elected leaders, public health professionals in and out of government, Non-governmental organizations, and health scientists to work together to implement alcohol policies that protect people from the negative effects of alcohol. The most effective policies are designed to promote moderate drinking and encourage people not to drink at all. Alcohol problems can be minimized or prevented using a coordinated, systematic policy response. Alcohol policies that limit access to alcoholic beverages, discourage driving under the influence of alcohol, reduce the legal purchasing age for alcoholic beverages, limit marketing exposure and increase the price of alcohol, are likely to reduce the harm linked to drinking. In most countries, regulation of affordability, physical availability, and alcohol promotions are the most cost-effective strategies. Which are the effects on alcohol-producing industries and what role do they play when making decision at the political and public health level? The producers of beer, spirits and wine can influence the extent of alcohol-related harm in a society through their commercial activities and political activities. Their business practices include the design of new alcohol products that appeal to youth, women and heavy drinkers. Their political activities include lobbying for de-regulation and opposition to public health measures that restrict the price and availability of alcohol. The alcohol industry has an ethical responsibility to minimize the harm caused by its products at all stages of the production chain, including product design and marketing. The ethical responsibility of the industry for the harm caused by its products cannot be regarded solely as a national issue. Multinational corporations have a responsibility for their behavior all over the world, and should adhere to minimal ethical standards for responsible product design and marketing practices regardless of the country where their products are sold. When economical intervention aim to reduce alcohol consumption. What is the responsibility of health programs in support of economic -taxes- policies? Health programs, health care professionals and public health agencies in government all have a responsibility to support policies that are known to be effective in reducing alcohol-related harm. Reasonable tax policies and controls on alcohol availability are effective ways to reduce harm. The health sector should be united in support of government policies that prevent easy access to alcohol by adolescents, and the sale of alcohol products at very low prices.